Wire Rope Sling - Single Leg Thimble and Thimble - 1/4"
Wire Rope Sling - Single Leg Thimble and Thimble - 3/8"
Wire Rope Sling - Single Leg Thimble and Thimble - 1/2"
Wire Rope Sling - Single Leg Thimble and Thimble - 5/8"
Wire Rope Sling - Single Leg Thimble and Thimble - 3/4"
Wire Rope Sling - Single Leg Thimble and Thimble - 7/8"
Wire Rope Sling-Single Leg Thimble and Thimble - 1"
Our single leg thimble and thimble wire rope slings are an extremely versatile and strong sling due to the reinforcement of a thimble in each eye loop. 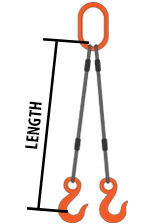 Available in a range of diameters, they can be used in a choker, basket, or vertical hitch, and are often used in conjunction with anchor shackles. Thimble and thimble wire slings are available in either a 6x25 or a 6x36 wire rope, and manufactured with Flemish eyes to offer superior efficiency. We also offer eye and eye sliding choker wire slings as well as cable laid in an eye and eye configuration. Domestic eye and eye wire slings also available. Domestic single leg cable slings are also available customized with thimbles. Don’t see what you need or wish to customize to your own specifications? Give our sales team a call for more information or to place a custom lifting sling order.